I’m looking for volunteers for four things. Two of the items can be done anywhere in the world, so there’s something for everyone! 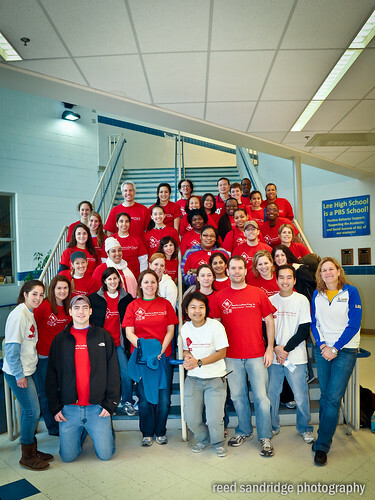 On Saturday April 16th I am volunteering at DC Servathon, a city-wide volunteer movement. I am leading a small team of people who will be working to make some improvements at the Maya Angelou Charter School. We are in need of volunteers and donations. If you are interested in volunteering making a financial contribution, click here. Volunteers from MLK Service Day! On Saturday April 30th I am involved in another service day called Hands-On-DC! We’ll be tackling a DC public school and need more volunteers. Click here to sign up or make a financial contribution to provide college scholarships for underprivileged kids in DC. We need a new Kindness Investor on Year of Giving! If you or someone you know is unemployed or underemployed and wants to spend seven amazing days investing in kindness let me know. Click here for more details. The Worldwide Day of Giving is back! That’s right, this coming June 15th is the second annual Worldwide Day of Giving. Last year over a thousand people from around the world participated by giving $10 to stranger. This year, you have an additional option for those who would prefer to volunteer. Both options are a lot of fun. Details can be found here or on the Facebook Page. I need your help in spreading the word so that we can make this another amazing day! Use your Facebook, twitter, whatever…just spread the love! The idea of giving $10 on June 15th is great. Can’t we move that to the 15th of every month? This is something most of us could do.